Any rent or revenue derived from land which is situated in India and is used for agricultural purposes. Any income derived from such land by agriculture operations including processing of agricultural produce so as to render it fit for the market or sale of such produce. Any income attributable to a farm house subject to satisfaction of certain conditions specified in this regard in section 2(1A). Any income derived from saplings or seedlings grown in a nursery shall be deemed to be agricultural income. As per section 10(2), amount received out of family income, or in case of impartible estate, amount received out of income of family estate by any member of such HUF is exempt from tax. Example-1. HUF earned `. 5,00,000 during the previous year and paid tax on its income. Mr. A, a co-parcener is an employee and earns a salary of `.20,000 p.m. During the previous year Mr. A also received `.1,00,000 from HUF. Mr. A will pay tax on his salary income but any sum of money received from his HUF is not chargeable to tax in Mr. A’s hands. Example-2. HUF earned `.90,000 during the previous year 2016-17 and it is not chargeable to tax. Mr. A, a co-parcener is earning individual income of `. 20,000 p.m. Besides his individual income, Mr. A receives `.30,000 from his HUF. 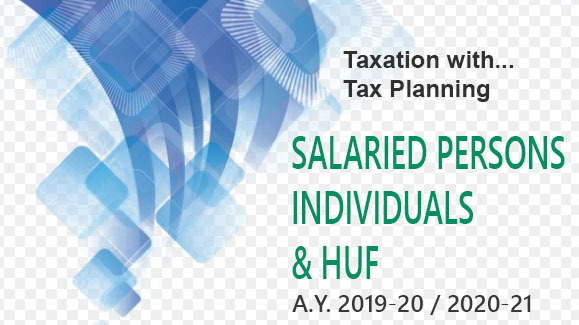 Mr. A will pay tax on his individual income but any sum of money received by him from his HUF is not chargeable to tax in the hands of co-parcener whether the HUF has paid tax or not on that income. As per section 10(2A), share of profit received by a partner from a firm is exempt from tax in the hands of the partner. Further, share of profit received by a partner of LLP from the LLP will be exempt from tax in the hands of such partner. This exemption is limited only to share of profit and does not apply to interest on capital and remuneration received by the partner from the firm/LLP. 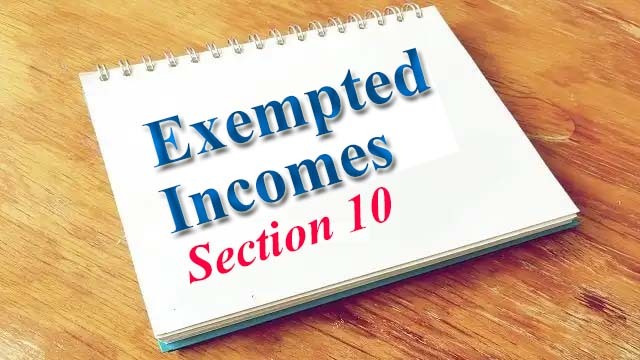 As per section 10(4)(i), in the case of a non-resident any income by way of interest on certain notified securities or bonds (including income by way of premium on the redemption of such bonds) is exempt from tax. As per section 10(4)(ii), in the case of an individual, any income by way of interest on money standing to his credit in a Non-Resident (External) Account in any bank in India in accordance with the Foreign Exchange Management Act, 1999, and the rules made thereunder is exempt from tax. Exemption under section 10(4)(ii) is available only if such individual is a person resident outside India as defined in clause (q) of section 2 of the said Act or is a person who has been permitted by the Reserve Bank of India to maintain the aforesaid Account. Any income by way of interest on moneys standing to his credit in a Non-Resident (External) Account in any bank in India shall be exempt from tax in case of an individual who is a person resident outside India or is a person who has been permitted by the RBI to maintain the aforesaid account. The person residing outside India shall have the same meaning as defined under Foreign Exchange Regulation Act, 1973, FEMA, 1999. This exemption shall not be available on any income by way of interest paid or credited on or after 1-4-2005. In case of an individual, being a citizen of India or a person of Indian origin, who is nonresident, any income from interest on such savings certificates issued by the Central Government, as Government may specify in this behalf by notification in the Official Gazette, shall be fully exempt. The exemption under this section shall not be allowed on bonds or securities issued on or after 1-6-2002. This exemption shall be allowed only if the individual has subscribed to such certificates in Foreign Currency or other foreign exchange remitted from a country outside India in accordance with the provisions of the Foreign Exchange Act, 1973, FEMA, 1999 and any rules made there under. For this purpose, a person shall be deemed to be of Indian origin if he or either of parents or any of his grandparents, was born in India or in undivided India. on leave to any place in India. to any place in India after retirement from service or after the termination of his service. where no recognised public transport system exists, an amount equivalent to the airconditioned first class rail fare, for the distance of the journey by the shortest route, as if the journey had been performed by rail. Exemption will, however, in no case exceed, actual expenditure incurred on the performance of journey. HOW MANY TIMES CAN EXEMPTION BE CLAIMED? The assessee can claim exemption in respect of any two journeys in a block of 4 years. For this purpose, the first block of 4 years was calendar years 1986-89, second block was 1990-93, third block was 1994-97, fourth block was 1998-2001, fifth block was 2002-05 sixth block was 2006-09, seventh block is 2010 to 2013, eight block is 2014-2017 and ninth block will be 2018-2021. If the assessee has not availed of the exemption of LTC in a particular block, whether for both the journeys or for one journey, he can claim the exemption of first journey in the calendar year immediately succeeding the end of the block of four calendar years. In other words, maximum one journey can be carried forward and that too only for the first journey in the following calendar year unless the period is otherwise extended. Such journey undertaken during the extended period will not be taken into account for determining the tax exemption of two journeys for the succeeding block. The exemption relating to LTC shall not be available to more than two surviving children of an individual after 1.10.1998. Exception: The above rule will not apply in respect of children born before 1.10.1998 and also in case of multiple birth after one child. In case the LTC is encashed without performing the journey, the entire amount received by the employee would be taxable. parents, brothers & sisters of the employee, who are wholly or mainly dependent upon him. The exemption can be availed for the journey undertaken while on leave during the tenure of service or even after retirement/termination from service. The exemption is allowed only in respect of fare. Expenses incurred on porterage, conveyance from residence to the railway station/airport/bus stand and back, boarding and lodging or expenses during the journey will not qualify for exemption. Exemption is available in respect of shortest route. Where the journey is performed from the place of origin to different places in a circular form or in any other manner, the exemption for that journey will be limited to what is admissible for the journey from the place of origin to the farthest point reached, by the shortest route. The remuneration received by an ambassador or other officials of the Embassy, High Commission or Legation of a foreign State in India. The remuneration by a consular officer of a foreign State in India. The remuneration received by a trade commissioner or other official representative in India of a foreign State, provided corresponding officials of the Government of India in that country are given a similar concession. The remuneration received by a member of the staff of any of the officials referred to in (a), (b) and (c) above. If the person mentioned above in (a) to (d) is a subject of the country represented, is not engaged in any business, profession or employment in India (otherwise than as a member of such staff), and the country represented gives similar concession to the members of the staff of corresponding officials of the Government of India. such remuneration is not liable to be deducted from the income of the employer chargeable under the Act. (iii) Employment on a foreign ship [U/s 10(6)(viii)]. Any income chargeable under the head “Salaries” received by or due to any such individual being a non-resident, as remuneration for service rendered in connection with his employment on a foreign ship where his total stay in India does not exceed in the aggregate of a period of 90 days in the previous year. (iv) Remuneration received by an employee of foreign govt. during his stay in India for his training in India [U/s 10(6)(xi)]. Any society registered under Societies Registration Act; 186Q and which is wholly financed by Central or State govt. Where a foreign company renders technical services to Government of India or to a State Government or to an Indian enterprise and for such services a foreign company is paid income by way of royalty or fees. Such fees or royalty is paid by an India concern in pursuance of an agreement entered into before 1-6-2002 and such agreement is approved by Government of India and it is in accordance with the Industrial Policy of the Government of India. Since royalty or fees paid to a foreign company accrues in India, so such income is liable to be taxed in India and as per agreement the payer of income in India pays tax liability of the foreign company. Tax so paid by Government of India or a State Government or an Indian enterprise will be exempted i.e., it will not be grossed up with the income of the foreign company. Example. A foreign company renders technical services to an Indian company and as per agreement, foreign company is to be paid a fees of Rs. 1,00,000. Tax of Rs. 30,000 on such fees is also paid by the Indian company. Tax paid by Indian company will be exempt and so it will not be grossed up with the income of the foreign company and such foreign company’s income will be only Rs. 1,00,000. The tax liability of a non-resident (Not being a company) or a foreign company if paid by an Indian concern or Government of India or a State Government the same will be exempted and so will not be grossed up with the income of the foreign entity. Tax paid on income received by foreign government or a foreign enterprise on leasing aircraft. In case any income is received by a foreign government or a foreign enterprise from an Indian company which is engaged in the operation of aircraft and such income is by way of consideration of acquiring an aircraft or an engine of aircraft (other than payment for providing spares or services in connection with the operation of leased aircraft) on lease under an agreement entered into after 31-3-1996 but before 1-4-2007 and approved by the Central Government in this behalf, and the tax on such income is payable by such Indian company under the terms of agreement, the tax so paid shall be fully exempted. This benefit shall be available only to that foreign enterprise which is non-resident. Any allowances or perquisites paid or allowed, as such, outside India by the Government to a citizen of India, for rendering services outside India, are exempt. While salary of Indian citizen in the above case shall be deemed to accrue or arise in India but all allowances or perquisites paid outside India by the Government to the above Indian citizens for their rendering services outside India are exempt under section 10(7). any other income of such individual which accrues or arises outside India and is not deemed to accrue or arise in India, in respect of which individual is required to pay any income or social security tax to the Government of that foreign State. Any remuneration or fee received by a consultant from an international organisation who derives its fund under technical assistance grant agreement between such organisation and the Foreign Government, and any other income accruing or arising to him outside India (which is not deemed to accrue or arise in India) and which is subject to income-tax or social security tax in foreign country, shall be fully exempted. The agreement of the service of consultant must be approved by the competent authority. any person who is non-resident ; and is rendering technical services in India in connection with any technical assistance programme or project. The fees or remuneration is paid for technical services rendered in India under the technical assistance programme or project. The sum is paid directly or indirectly out of funds made available to international organization as per agreement between such organization & government of foreign state. The technical assistance provided is in accordance with such agreement. Any agreement for appointment of consultant shall have to be approved by the authorities prescribed. Any other income which accrues or arises outside India is subjected to any income or social security tax in other state. the contract of service is approved by the competent authority. The individual should be an employee of consultant referred to in clause 8A above. His contract of service is approved by the prescribed authority. The remuneration is received in connection with technical assistance programme referred to in clause 8A. As per section 10(9), the income of any member of the family of any such individual as is referred to in section 10(8)/(8A)/(8B) accompanying him to India, which accrues or arises outside India and is not deemed to accrue or arise in India, in respect of which such member is required to pay any income or social security tax to the Government of that foreign State or country of origin of such member, as the case may be, is exempt from tax. (b) the legal heir on the event of the death of the employee. Gratuity received by an employee on his retirement is taxable under the head "Salary" whereas gratuity received by the legal heir of the deceased employee shall be taxable under the head "Income from other sources". However, in both the above cases, according to section 10(10) gratuity is exempt upto a certain limit. Therefore, in case gratuity is received by employee, salary would include only that part of the gratuity which is not exempt under section 10(10). Section 10(10)(i) grants exemption to gratuity received by Government employee (i.e., Central Government or State Government or local authority). (i) Basic salary plus dearness allowance. (2) Half months average salary of each completed year of service. (i) Basic Salary plus D.A. to the extent the terms of employment so provide Commission, if fixed percentage of turnover. (ii) Average salary of last 10 months preceding the month in which event occurs. (iii) Only completed year of service is to be taken. Where an employee had received gratuity in any earlier year(s) and had claimed exemptions under section 10(10) in respect of the gratuity received earlier also, he will still be entitled to this exemption but the limit which at present is `10,00,000 shall be reduced by the amount of exemption(s) availed in the earlier year(s). There will be no change in the other two limits. The words "completed service" occurring in section 10(10) should be interpreted to mean an employee's total service under different employers including the employer other than the one from whose service he retired, for the purpose of calculation of period of years of his completed service, provided he was not paid gratuity by the former employer. CIT v P.M. Mehra (1993) 201 ITR 930 (Bom). Any gratuity paid to an employee, while he continues to remain in service with the same employer is taxable under the head "Salaries" because gratuity is exempt only on retirement or on his becoming incapacitated or on termination of his employment or death of the employee. In this case, however the assessee can claim relief under section 89. The CBDT vide its instruction in F. No. 194/0/73-IT, dated 19.6.1973 has clarified that the expression "termination of employment" would cover an employee who has resigned from the service. (a) If gratuity is not received Commuted value of half of pension which he is normally entitled to receive. (b) If gratuity is also received Commuted value of 1/3rd of pension which he is normally entitled to receive. Pension received by the employee is taxable under the head "Salaries". However, the family pension received by the legal heirs after the death of the employee is taxable in the hands of the legal heir under the head "Income from other sources" because in this case there is no relationship of employer and employee. Treatment of family pension is discussed in detail under the head 'Income from other sources'. Basic salary plus D.A. to the extent the terms of employment so provide plus Commission, if fixed percentage of turnover. Average salary of last 10 months immediately proceeding the date of retirement. Amount specified by the Central Government, i.e. ₹. 5,00,000. Compensation received in excess of the aforesaid limit is taxable and would, therefore, form part of Gross Salary. However, the assessee shall be eligible for relief under section 89 read with rule 21A. Where retirement compensation is received by a workman in accordance with any scheme which the Central Government having regard to the need for extending special protection to the workman in the undertaking to which such scheme applies, has approved in this behalf, the entire amount of compensation so received shall be exempt under section 10(10B). Where retrenchment compensation received by a workman exceeds the amount which qualifies for exemption under the new clause, he will be entitled to relief under section 89 read with rule 21A of the Income-tax Rules, in respect of such excess. Any amount received under the provision of such Act or any scheme framed there under shall be fully exempted but in case payment is received against a loss or damage, for which deduction has been claimed ealier, it shall be taxable. Institutions having importance throughout India or in any State or States as may be notified. The compensation is received only at the time of voluntary retirement or termination of his services in accordance with any scheme or schemes of voluntary retirement or in the case of public sector company, a scheme of voluntary separation. Even if the compensation is received in instalments, the exemption shall be allowed. Further, the scheme of the said companies or authorities or societies or universities or the institutes referred to in clauses (vii) and (viii) above, as the case may be, governing the payment of such amount, are framed in accordance with such guidelines (including inter alia criteria of economic viability) as may be prescribed. In the case of public sector companies, if there is a scheme of voluntary separation, it shall also be according to the said prescribed guidelines. The exemption is available to an employee only once and if it has been availed for an assessment year it shall not be allowed to him for any other assessment year. The assessee shall not be eligible for relief under section 89 in case he has claimed exemption under section 10(10C). On the other hand, if he claims relief under section 89, he cannot claim exemption under section 10(10C). The income-tax actually paid by the employer himself on a non-monetary perquisite provided to the employee shall be exempt in the hands of the employee..
Keyman insurance policy means a life insurance policy taken by a person on the life of another person who is or was the employee of the first mentioned person or is or was connected in any manner whatsoever with the business of the first mentioned person and includes such policy which has been assigned to a person, at any time during the term of the policy, with or without any consideration. Interest credited to such fund is exempt in the hands of the employee. Lump sum amount received from such fund, at the time of termination of service is exempt in the hands of employees. The accumulated balance due and becoming payable to an employee participating in a recognised provident fund, is exempt to the extent provided in rule 8 of part A of the Fourth Schedule. Employer’s contribution to such fund, up to 12% of salary is not treated as income of the employee (see Note 1). Interest credited to such fund up to 9.5% per annum is exempt in the hands of the employee, interest in excess of 9.5% is charged to tax in the hands of the employee. Employer’s contribution to such fund is not treated as income of the employee. Interest credited to such fund is exempt in the hands of the employees. Interest credited to such fund is exempt. 1. Salary for this purpose will include basic salary, dearness allowance, if the terms of service so provide and commission based on fixed percentage of turnover achieved by the employee. (a) If the employee has rendered a continuous service of 5 years or more. If the accumulated balance includes amount transferred from other recognised provident fund maintained by previous employer, then the period for which the employee rendered service to such previous employer shall also be included in computing the aforesaid period of 5 years. (b) If the service of employee is terminated before the period of 5 years, due to his ill health or discontinuation of business of the employer or other reason beyond his control. (c) If on retirement, the employee takes employment with any other employer and the balance due and payable to him is transferred to his individual account in any recognised fund maintained by such other employer, then the amount so transferred will not be charged to tax. Except above situations, payment from a recognised provident fund will be charged to tax considering such fund as un-recognised from the beginning (See note 3 given below for tax treatment of un-recognised provident fund).  Employee's contribution is not chargeable to tax; interest on employee contribution is taxed under the head “Income from other sources”.  Employer's contribution and interest thereon are taxed as salary income, however, an employee can claim relief under section 89 in respect of such payment. Like Provident Fund, Superannuation fund is also a scheme of retirement benefits for the employee. These are funds, usually established under trusts by an undertaking, for the purpose of providing annuities, etc., to the employees of the undertaking on their retirement at or after a specified age, or on their becoming incapacitated prior to such retirement, or for the widows, children or dependents of the employees in case of the any employee's earlier death. The trust invests the money contributed to the fund in the form and mode prescribed. Income earned on these investments shall be exempt, if any such fund is an Approved Superannuation Fund. Employee's contribution: Deduction is available under section 80C from gross total income. Employer's contribution: Contribution by the employer to the approved superannuation fund is exempt upto ₹1,50,000 per year per employee. If the contribution exceeds ₹1,50,000 the balance shall be taxable in the hands of the employee. Interest on accumulated balance: It is exempt from tax. by way of transfer to the account of the employee under a pension scheme referred to in section 80CCD and notified by the Central Government. Since there is a possibility of change in any of the above factors during the previous year, exemption for HRA should not always be calculated on annual basis. As long as there is no change in any of the above factors it can be calculated together for that period. Whenever there is a change in any of the above factors, it should be separately calculated till the next change. The full amount of scholarship granted to meet the cost of education is exempted. ‘Cost of education’ includes not only the tuition fees but all other expenses which are incidental to acquiring education. Scholarship may have been given by Govt., University, Board, Trust, etc. The exemption is irrespective of actual expenditure incurred by the recipient to meet the cost of education. • Daily allowance received by a Member of Parliament or by a Member of State Legislature or by member of any committee thereof. Any award instituted in the public interest by the Central Government or State Government or by any other body approved by the Central Government in this behalf. Any reward by the Central Government or any State Government for such purpose as may be approved by the Central Government in this behalf in the public interest. >> he/she has been awarded ‘Param Vir Chakra’ or ‘Mahavir Chakra’ or ‘Vir Chakra’ or such other notified gallantry awards. Also, any amount received as family pension by any member of the family of an individual referred above shall be fully exempted. Income should be applied or accumulated wholly and exclusively for the objects for it established. 1. Exemption shall not be denied in relation to voluntary contribution [other than voluntary contribution in cash or voluntary contribution of the nature referred to in (i), (ii), (iii) or (iv) supra]subject to the condition that such voluntary contribution is not held by the research association otherwise than in any one or more of the forms or modes specified in subsection (5) of section 11, after the expiry of one year from the end of the previous year in which such asset is acquired. In case there is any income of a news agency set up solely in India for collection and distribution of news and which is so notified in this behalf shall be fully exempted provided such income or accumulated income is used solely for collection and distribution of news and not to be distributed in any manner amongst its members. Professional institution is established in India for the purpose of control, supervision, regulation or encouragement of the profession of law, medicine, accountancy, engineering or architecture or such other notified profession. The institution applies its income, or accumulates it for application, solely to the objects for which it is established. The institution is approved by the Central Government by general or special order. Any income of such fund which is approved by Conmiissioner of Income-tax shall be fully exempted provided its income is applied wholly and exclusively for the objects for which it is established. to meet the cost of education of dependent children of members. Income is attributable to the business of production, sale, or marketing, of khadi or products of village industries. a society for religious or charitable purposes registered under Societies Act 1860, shall be exempted from tax. Any income of European Economic community derived in India by way of interest, dividend or capital gain from investments made out of its funds under such scheme as the Central Govt. may notify is fully exempted. Any income of a fund set up as SAARC Fund for Regional Projects set up by Colombo Declaration issued on 21st. Dec. 1991 by Heads of State or Government of the Member Countries of South Asian Association for Regional Co-operation shall be fully exempted. Any income of the Prasar Bharti (Broadcasting Corporation of India) established under section 3(1) of the Prasar Bharti (Broadcasting Corporation of India) Act, 1990, shall be exempt. Any income received by any person on behalf of the Prime Minister’s National Relief Fund, the Prime Minister’s Fund (Promotion of Folk Art) or the Prime Minister’s Aid to Students Fund is exempt from tax under clause (i), (ii) and (iii) of section 10(23C) respectively. a non profit earning body other than those mentioned at (a) and (b) above but are approved by the prescribed authority. other than those mentioned a) and (b) above but is approved by the prescribed authority. any trust or institution set up wholly for religious purposes or purpose which may be notified by the Central Government. The above exemption shall not be available for the profits and gains of any business which is carried on, on behalf of or by any fund or institution referred in points (iv) and (v) above or to the profits or gains of any business undertaking held under trust for the purposes of any fund or institution referred in points (iv) and (v) above. This amendment has come into effect from assessment year 1984-85. In case annual receipts of such an institution exceeds ` 1 crore in a previous year, it has to file an application upto 30th September in the succeeding financial year. Under Section 10(23C) income of institutions specified above shall be exempt from income tax. In certain cases, approvals are required to be taken from prescribed authority in the prescribed manner to became eligible for claiming exemption. A mutual fund registered under the Securities and Exchange Board of India Act or regulation made thereunder. A mutual fund set-up by a public sector bank, or a public financial institution or authorised by RBI (subject to conditions notified by the Central Government). Any income of a securitisation trust from the activity of securitisation shall be exempt. Any income by way of contributions received from recognised stock exchanges and the members thereof, of a notified Investor Protection Fund set up by recognised stock exchanges in India is exempt from tax. Provided that where any amount standing to the credit of the Fund and not charged to income-tax during any previous year is shared, either wholly or in part with a depository, the whole of the amount so shared shall be deemed to be the income of the previous year in which such amount is so shared and shall, accordingly, be chargeable to income-tax. As per this amendment, the exemption will now be available only in respect of income of a Venture Capital Company or Venture Capital Fund from investment in a venture capital undertaking engaged in certain specified businesses or industries. Meaning of Venture Capital Company. A company which has been registered before 21-5-2012 under the SEBI Regulations, 1996 (Venture Capital Fund Regulation) or which has been registered as venture capital fund being a sub category of category 1 Alternative Investment Fund under the SEBI Regulation 2012 (Alternative Investment Fund Regulations). The Company has to satisfy the conditions mentioned in clause (a). Meaning of Venture Capital fund. A trust which has been registered before 21-5-2012 under the Venture Capital Fund Regulations or which has been registered as venture capital fund being a sub-category of category 1 Alternative Investment Fund under the Alternative Investment Funds Regulations. The trust has to satisfy the conditions mentioned in clause (b). Meaning of venture Capital undertaking. As defined under the Venture Capital Fund Regulation or under the Alternative Investment Funds Regulation. The trade union must be a registered one and formed primarily for the purpose of regulating the relations between workmen and employer or between workmen and workmen. This benefit shall also be available to an association of registered trade unions. Interest on securities which are held by or are the property of any provident fund to which Provident Funds Act, 1925 applies and any capital gains of the fund arising from the sale, exchange or transfer of such securities. Any income received by the trustees on behalf of a recognised provident fund. Income of such fund is fully exempted. Certain types of incomes of the members of Scheduled Tribes living in tribal areas are exempt from tax. The Scheduled Tribes to which this exemption applies are defined in Clause (25) of Article 366 of the Constitution, residing in any areas specified in Part A or Part B of the table appended to paragraph 20 of the Sixth Schedule of the Constitution or in the State of Arunachal Pradesh, Manipur, Tripura, Mizoram and Nagaland or in the Ladakh region of the State of Jammu & Kashmir. This means that if a member of a Schedule Tribe sets up a business at any place other than mentioned above, profit from such business will be taxable. income by way of dividend or interest on securities. This exemption will not be available to a Sikkimese women who, on or after 1-4-2008 marries a non-Sikkimese individual. Any income of an agricultural produce market committee or board constituted under any law for the time being in force for the purpose of regulating the marketing of agricultural produce shall be exempted. Income of such corporation or body, institutions or associations which are wholly financed by govt. and which have been set-up to promote the interest of above mentioned communities shall be fully exempted. Any income of a corporation established by the Central Government or State Government for promoting the interests of the members of such minority community as notified by the Central Government from time-to-time, is exempt from tax under Section-10(26BB). From assessment year 2004-05, any income of a statutory corporation established by Central, State or Provincial Act for the welfare and economic upliftment of ex-servicemen (being citizen of India) is exempt from tax under section 10(26BBB). “Ex-Serviceman” means a person who has served in any rank, whether as combatant or non-combatant, in the armed forces of the Union or armed forces of the Indian States before the commencement of the Constitution (but excluding the Assam Rifles, Defence Security Corps, General Reserve Engineering Force, Lok Sahayak Sena, Jammu and Kashmir Militia and Territorial Army) for a continuous period of not less than six months after attestation and has been released, otherwise than by way of dismissal or discharge on account of misconduct or inefficiency, and in the case of a deceased or incapacitated ex-serviceman includes his wife, children, father, mother, minor brother, widowed daughter and widowed sister, wholly dependant upon such ex-serviceman immediately before his death or incapacitation. Such income shall be fully exempted provided the membership of such society consists of only other cooperative societies formed for similar purposes and the finances of the society are provided by Government and such other societies. The Spices Board constituted under sub-section (1) of section 3 of the Spices Board Act, 1986 (10 of 986), in any previous year relevant to any assessment year commencing on or after the 1St day of April, 1986 or the previous year in which such Board was constituted, whichever is later. The Coir Board established under section 4 of the Coir Industry Act, 1953. In the case of a taxpayer, who carries on business of growing and manufacturing tea in India, the amount of any subsidy received from or through the Tea Board under the notified scheme for replantation or replacement of tea bushes or for rejuvenation or consolidation of the area used for cultivation of tea, is exempt from tax (for notified schemes see Notification No. S.O. 3616, dated September 27, 1976). To claim exemption, a certificate from the Tea Board as to the amount of subsidy paid to the taxpayer during the year is to be obtained. Any amount received as subsidy from or through the concerned Board for replantation or replacement of Rubber, Coffee, cardamom plants or plants for growing of such other commodities or for any other scheme so notified shall be fully exempted. In case income of a minor child is clubbed with the income of his parent, the parent can claim exemption upto actual income of child clubbed or 1,500 whichever is less in respect of each minor child whose income is included. Any income arising to an assessee being a shareholder, on account of buyback of shares, (not being listed on a recognised stock exchange) by the company as referred to in section 115QA shall be exempt. Any income received by any person being an investor of the Securitisation Trust from such a trust, by way of distributed income referred to in section 115TA shall be exempt. With a view to mitigate the hardship faced by the farmers whose agricultural land situated in specified urban limits has been compulsorily acquired, the Finance (No. 2) Act, 2004 has inserted a new clause (37) in section 10 so as to exempt the capital gains (whether short-term or long-term) arising to an individualor a Hindu undivided family from transfer of agricultural land by way of compulsory acquisition where the compensation or the enhanced compensation or consideration, as the case may be, is received on or after 1.4.2004. The exemption is available only when such land has been used for agricultural purposes during the preceding two years by such individual or a parent of his or by such Hindu undivided family. Where the compulsory acquisition has taken place before 1.4.2004 but the compensation is received after 31.3.2004, it shall be exempt. But if part of the original compensation in the above case has already been received before 1.4.2004, then exemption shall not be available even though balance original compensation is received after 31.3.2004. However, enhanced compensation received on or after 1.4.2004 against agricultural land compulsory acquired before 1.4.2004 shall be Exempt. If such urban agricultural land is held as stock-in-trade, section 10(37) shall not be applicable as it is not a capital asset. Profit from the compulsory acquisition of such urban land shall be taxable under business head. is notified by the Central Govt. in this regard. is notified by the Central Government in the Official Gazette for the purposes of this clause. shall be exempt. (c) is notified by the Central Government in the Official Gazette for the purposes of this clause. shall be exempt. the foreign company is not engaged in any activity, other than reciept of such income, in India.